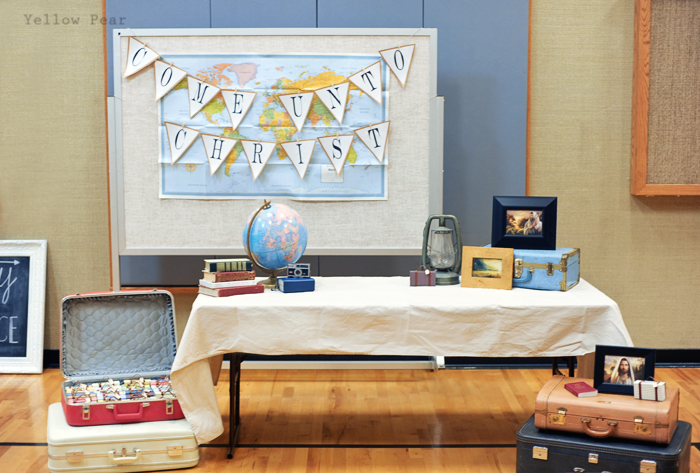 We decorated with maps, globes, suitcases (that I gathered from home and realized I have quite the collection), lanterns, cameras, scriptures and pictures of Christ to carry out the travel theme. We made the mini suitcases out of matchboxes and packed them accordingly (more on that later). Our invitations were personalized boarding passes...which the girls loved. I did not get many photos (grrr...I missed a lot of the decorations and the food) but it ended up being very simple and hopefully effective. I talked briefly about our journey through life and how we should prepare ourselves spiritually. I talked about following Christ's example and using the scriptures and prayer as a guide and compass. Then I pulled out one of the little suitcases and explained the contents and encouraged them to add more thoughts, notes and other insights as they see fit. Hopefully when faced with trials or questions, their little suitcase of spiritual essentials can help them weather the storms and adventures of life. 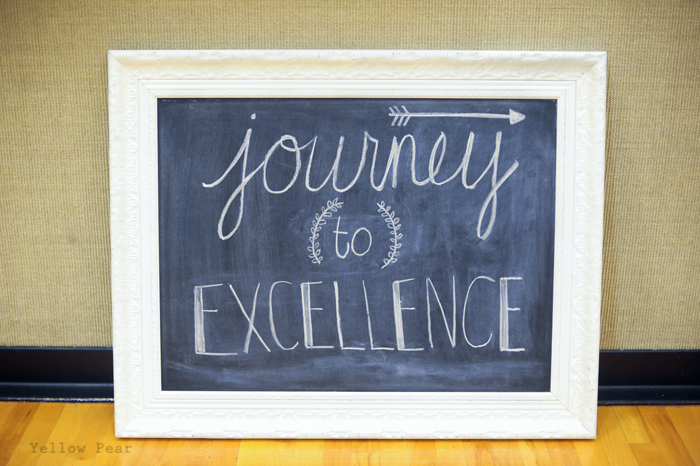 One of the other leaders spoke on Personal Progress and likened each value to a destination as part of our journey. It was very cute. She shared examples of projects that the girls had done that year and made a graph showing how far the girls had come on their Personal Progress. She even renamed the girls after countries in keeping with our travel theme and to keep their progress anonymous. 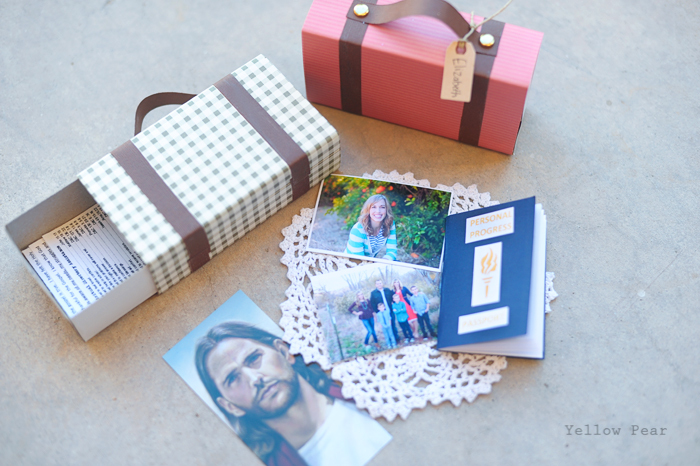 The little suitcases contained a photo of Christ, a picture of each girl and her family to remind her of her individual worth and that families are forever. 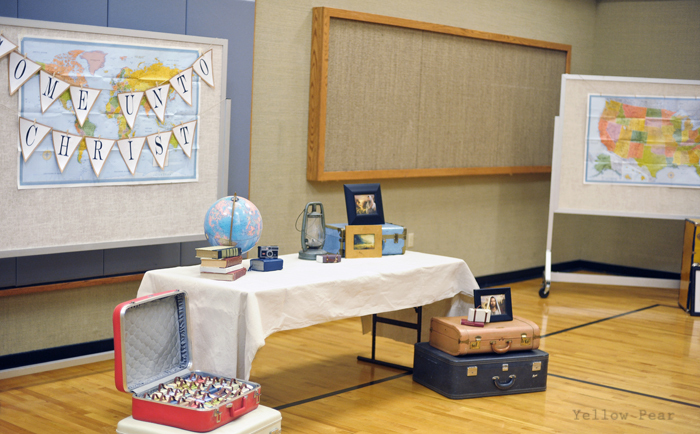 We also added their favorite quote and hymn and a photo of their favorite temple. Their own testimony as well as testimonies from leaders were added, along with a Spiritual Directory for scriptural help with different trials. Our Mia Maid adviser made tiny, personalized Personal Progress Passports for each girl, with a stamp for each Value Experience they've completed. They were adorable. The laurels helped gather all of the personal information from each girl, made the tiny luggage tags and helped me make the suitcases. We just wrapped matchboxes in patterned, vintage-type paper, glued two brown strips around and used gold brads to attach the handle. Two laurels even dressed as flight attendants and handed out little cups of snack mix as people came in and found their seats (another leader's cute idea). It was awesome. :) We then served cake decorated with a map for refreshments. I'm happy with how it turned out and I hope the girls will keep their little suitcases and remember to look at them now and again if they need a little boost. Also, I have soooooo many matches. I need to come up with some way to use them! It was wonderful, you did such a great job! 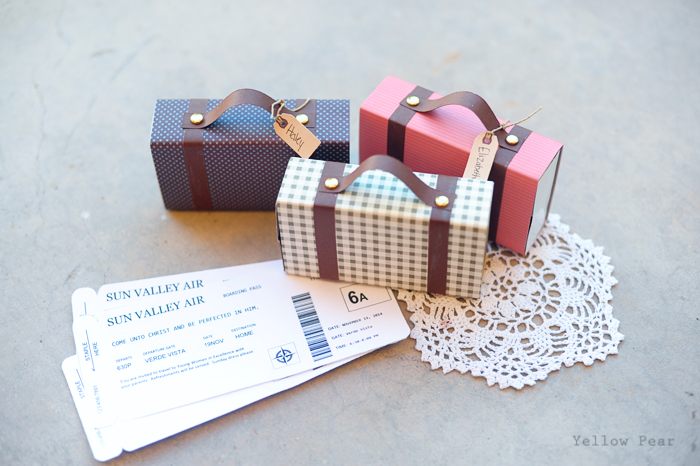 I loved the little suitcases and the yw as flight attendants! I love this, it needs to be in a magazine!